NOVEMBER | Michael R. Bruchas has been awarded the prestigious Jacob P. Waletsky Award for early career achievement in the neuroscience of addiction! OCTOBER | The Bruchas Lab has moved to University of Washington to join the new Center of Excellence in Neurobiology of Addiction, Pain and Emotion! SEPTEMBER | Michael R. Bruchas has been awarded a 10 year long NIH R01 MERIT Award for the continued investigation of the role of the kappa opioid receptor system in addiction and affective behavior! AUGUST | Raaj Gowrishankar and Leandra Mangieri join the laboratory as postdoctoral research fellows. Welcome Leandra and Raaj! MAY | Eric Zhang, a BME graduate student has joined the lab. Welcome Eric! JUNE I Dr. Michael R. Bruchas has accepted an invitation from the NIH to serve as chairperson of the Molecular Neuropharmacology and Signaling Study Section at the Center for Scientific Review, for a two year term beginning July 1, 2017. MAY I Marissa Hansen, Neuroscience Major at the University of Texas at Austin, was accepted into the Undergraduate BP-ENDURE program through DBBS and will work this summer in the Bruchas Lab. Marissa was selected from over 100 applicants into the program. Welcome Marissa! APRIL I Christian Pedersen, a BME Grad Student and Andrew Luskin, a DBBS Neuroscience Graduate Students have joined the lab. Welcome Christian and Andrew! JANUARY | Dylan Blumenthal joins the laboratory. Welcome Dylan! OCTOBER | Michael R. Bruchas, PhD has received $3.8 million in NIH funding to develop tools for mapping and activating pathways in the brain with light. You can read the full article published by WUSTL TheSOURCE here. SEPTEMBER | Congratulations to Dong-Oh Seo and Stephanie Nygard on their Journal of Neuroscience paper acceptance. JULY | Christine Stander has joined the lab as the Research Laboratory Manager. Welcome Christine! FEBRUARY | Bruchas Lab featured on HEC-TV: Remote Controlled Medication. Creating the possibility for remote controlled medication: direct drug delivery to the brain using a hand held remote. SEPTEMBER | WUSTL TheSOURCE published a Press Release on Jordan McCall's Neuron paper. Reward, aversion behaviors activated through same brain pathways. Findings may help explain why drugs for addiction, depression are not always effective. JULY | Jordan McCall, Ph.D Press Release on a paper published in Cell - "Wireless Optofluidic Systems for Programmable In Vivo Pharmacology and Optogenetics"
JUNE | Kyle Parker, Ph.D joins the laboratory. Welcome Kyle! JUNE | Dong-oh Seo, Ph.D joins the laboratory. Welcome Dong-oh! MAY | Jordan McCall and Ed Siuda, two neuroscience Ph.D students in the laboratory successfully defend their dissertations and graduate with a Ph.D in Neuroscience from Washington University! Congratulations Jordan and Ed! FEBRUARY | Ream Al-Hasani is awarded the prestigious "Pathway to Independence Award" from NIDA. This K99-R00 mechanism provides her with an additional two years of mentored phase funding, and 3 years of R01-like funding for when she opens her own independent laboratory. Congratulations Ream! For more information on her project visit this link. SEPTEMBER | Li Xia, M.S., joins the laboratory. Li is a second year Biomedical Engineering Ph.D student. Welcome Li! JULY | Adrian Gomez, Ph.D joins the laboratory. Welcome Adrian! JULY | Michael is awarded the Young Investigator Award from the International Narcotics Research Conference, INRC. The annual meeting which focuses on opioids is held every year across the world. In 2014 it was held in Montreal, Quebec. In accepting the award, Michael spoke about his prior and the current active research in the laboratory focused on dissecting the role of Kappa-opioid systems in reward and aversion. JULY | Jordan McCall, a graduate student in the laboratory is awarded the Lindau prize, to attend a select conference in Germany with 37 Nobel Lauretes. Congrats Jordan! FEBRUARY | Stephanie Nygard, Ph.D joins the laboratory. Welcome Stephanie! OCTOBER | The Bruchas Lab was granted a 4 year R01 research award called EUREKA (Exceptional Unconventional Research for Enabling Knowledge Acceleration) to examine the role of stress neuropeptides and G-protein coupled receptors in negative affective behaviors and addiction. The grant comes from the National Institute on Drug Abuse, and uses numerous behavioral, biochemical, and novel optogenetic hardware approaches for understanding how stress influences reward behaviors. AUGUST | The Bruchas Lab is granted a 5 years research grant (its first individual R01) to examine the role of Kappa-opioid receptors in selected neural circuits in nicotine induced behaviors. The grant comes from the National Institute on Drug Abuse, and uses numerous behavioral, biochemical, and optogenetic approaches for understanding how stress causes reinstatement of nicotine preference. JUNE | Skylar Spangler, a neuroscience graduate student, joins the lab. Welcome Skylar! JUNE | Jordan McCall, a neuroscience graduate student in the lab is awarded an NRSA from the National Institute for Mental Health. Congrats Jordan! APRIL | The Bruchas Lab publishes wireless optogenetics paper in Science. In collaborative efforts with Dr. John Roger's Lab at the University of Illinois, we developed the ability to control mouse behavior using a novel form of wireless optogenetics. The paper demonstrates various modes of operation in vitro and in vivo for these cellular scale LED devices. Robert Gereau IV, Professor of Anesthesiology and Michael R. Bruchas, Ph.D, Assistant Professor of Anesthesiology are awarded a Directors Common Fund Transformative Research Award with John Rogers, Ph.D, University of Illinois. 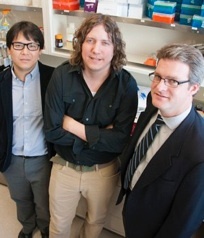 Gereau, Bruchas, and Rogers will be working to develop tiny, LED devices that could allow them to map the molecular and cellular properties of neural circuits. With this knowledge, scientists can better understand how those circuits transmit information after pain and nerve injury, or in reward and stress-induced behaviors. On the cover: Selective p38α MAPK deletion in serotonergic neurons produces stress-resilience in models of depression and addiction. In this issue of Neuron, Bruchas et al. found that activation of p38α only in serotonin neurons is required for stress-induced behaviors. The cover is a graphite drawing, made by the artist Robyn O'Neil and titled “These final hours embrace at last; this is our ending, this is our past.” She explains that the image depicts one man hanging by a fraying thread above a monstrous ocean. A darkening lid of clouds threatens from overhead, and a tumultuous body of water reaches up from underneath. He is shown in a maddening in-between, a most stressful of dilemmas, and where some would say rests the human condition. Artwork by Robyn O'Neil (http://robynoneil.com). JUNE 2011, Jordan McCall and Ed Siuda, DBBS Neuroscience Graduate Students, join the Bruchas Lab. Welcome! MARCH 2011, Ream Al-Hasani, Ph.D joins the Lab. Welcome, Ream!